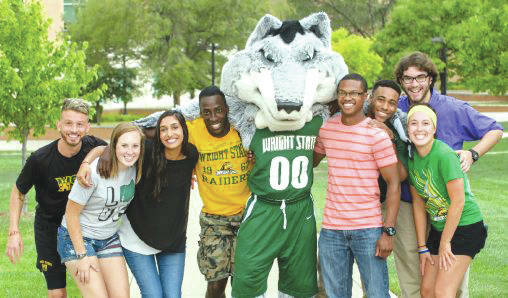 Submitted photo Wright State University is launching a number of efforts to increase enrollment. FAIRBORN — Joining universities across Ohio and the country grappling with domestic population shifts adversely affecting their typical student enrollment populations, Wright State University has embarked on a number of key initiatives to increase enrollments that target international students, scholarship recipients, Indiana students who live near Ohio and even high school sophomores. The number of students choosing Wright State has shrunk in the last five years. From fall 2012 to fall 2017, total headcount enrollment at Wright State declined by 3.8 percent. Recent enrollment declines have included sharp drops in international students, who pay higher tuition than domestic students. Wright State is taking innovative approaches to develop new enrollment strategies to target students who may not be aware of what Wright State has to offer, all the while continuing to serve the local areas that have been a traditional home of its student body. That change in approach involves numerous new enrollment initiatives either being implemented considered by Wright State. And it is part of an effort to find the most efficient, effective strategy to capture a shrinking high school population while maximizing the number of undergraduates as well as graduate, international, nontraditional and transfer students. – Stepped up the marketing of Wright State’s reciprocity agreements with 16 Indiana counties just across the Ohio state line. The agreements offer eligible Indiana students the same lower tuition paid by Ohio residents. – Launched a new communication campaign to recruit high school sophomores, many of whom are making their college decisions earlier than in the past. – Implemented the Common Application to increase visibility for prospective students whose high schools encourage using it. The Common App will make it easier to apply to Wright State and potentially generate more applicants. – Added state and college competitor matches to the college discovery programs of Naviance and Carnegie Dartlett. These programs are used by 67 percent of Ohio high schools and a majority of high schools across the country. – Launched parent communication plans to help parents of admitted students understand the admission and financial aid processes. An additional new effort includes plans to expand and diversify international recruiting instead of focusing on only one or two countries. And the recruiting efforts will be customized for each targeted country. – Agent network expansion into Morocco, the Baltic countries and Central Asia. – Full-time boots-on-the-ground recruiters as a part of new investment initiatives. Wright State is currently in negotiations with two international education consultancies that will manage full-time Wright State recruiting personnel across India, the Middle East, North Africa as well as Central Asia. By partnering with two companies for international recruiting, Wright State should be in a position to leverage decades of international recruiting experience. The International Admissions and Immigration units of the University Center for International Education have also begun implementing the SUNAPSIS software program that will increase the efficiency in processing international students. Still, international recruiting is expected to remain challenging as the dollar strengthens and competition for students grows worldwide. The university expects that by increasing Wright State’s physical presence at major recruiting fairs across a variety of countries, it will establish the Wright State’s brand and learn where its niche markets lie. The ultimate goal is to begin ensuring sustainable inflows of students from a variety of countries, creating a more balanced and stable portfolio. Students and families interested in learning more about Wright State and its academic programs should go to wright.edu/visit. https://www.fairborndailyherald.com/wp-content/uploads/sites/50/2018/08/web1_Rowdy-and-students-508×298.jpgSubmitted photo Wright State University is launching a number of efforts to increase enrollment.